We now look forward to our exciting Christmas schedule and all of the wonderful carol playing we will be involved with – it is a great time of the year and we always look forward to it very much. Keep an eye on the blog for photos and videos! We also have an exciting November with our Open Day. 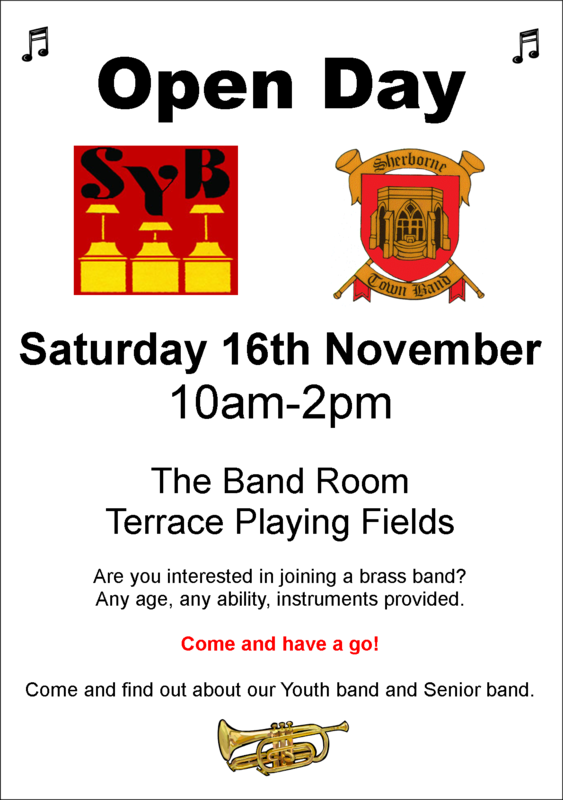 This is a chance for us to show the local community what we’re all about, our wonderful facilities and a chance for potential players (youth or senior) to come and find out all about STB! The day will be from 10am-2pm on Saturday 16th November 2013, at the Band Room, Terrace Playing Fields, Sherborne. (DT9 5NS). We hope to see as many people as possible – tell all your friends. Come and have a blow, a cup of tea, a nose around and a chat! 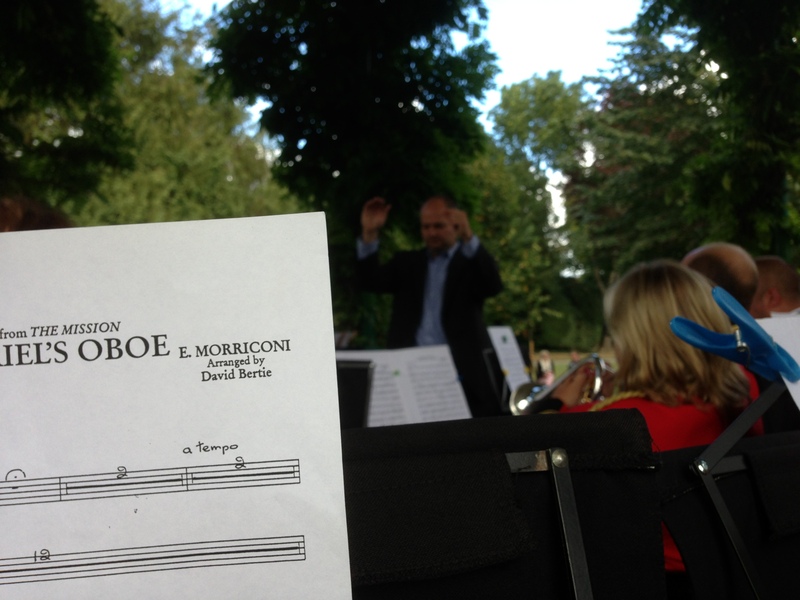 Well, we’ve just done our final of three fantastic concerts in the Pageant Gardens, Sherborne. The audience was brilliant, and everyone seemed to enjoy the Vintage Caravan Teas and Coffees – and the cakes were excellent too! We have thoroughly enjoyed entertaining the Sherborne community throughout the summer and look forward to more Music In The Park next year. Huge thanks go to Sherborne Town Council for supporting and helping put on the events, the audience who came and listened and of course our conductors, Steve Rogers and Paul Cosh. This is what we are about, music for the community, played by the local community. We hope you’ve enjoyed it too. We will be appearing in the Pageant Gardens again, next Saturday (14th) at the Catholic Church Fete, from 1pm onwards. We hope to see you there. I’ll leave you with a picture from the stand, which I took whilst on a 32 bar break from playing my cornet! 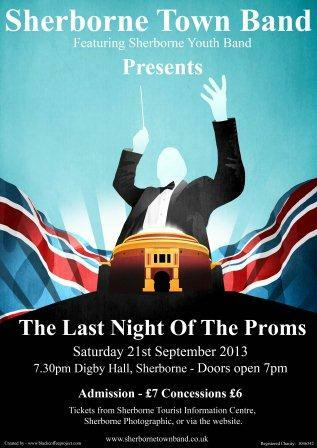 OH – I nearly forgot – don’t forget the Proms, on Saturday 21st September, our prestigious event where you can wave your flags, sing and enjoy the great young talents of the Sherborne Youth Band! Soloists to include Natalie Miles on Soprano Cornet and Colin Howell. It’s sure to be a fantastic night of entertainment and great music – tickets on sale NOW! See below for details – click on the image to go to the website for ticket information. Over and out for now… Joe. 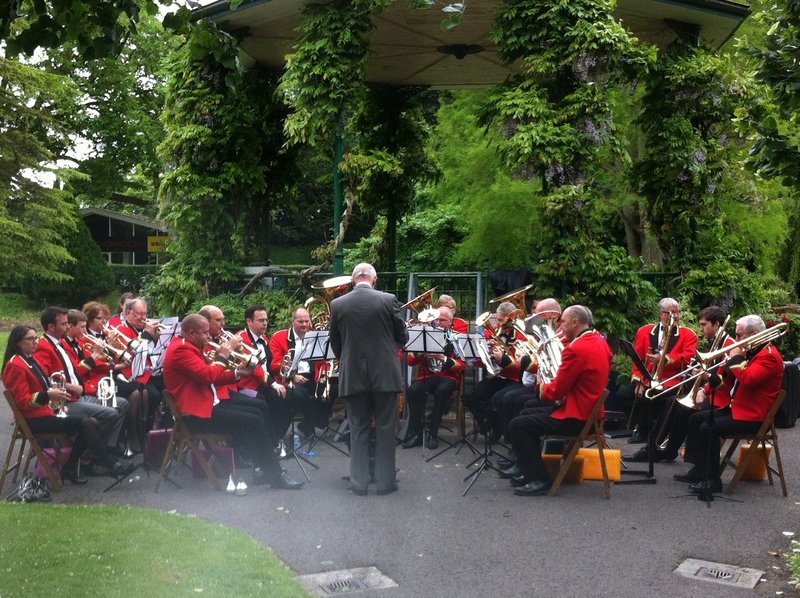 Yesterday saw the first of the 3 Sherborne Town Band Music In the Park concerts in the Pageant Gardens, Sherborne. Despite bad weather, the event was attended by many, and the band sounded great. The audience enjoyed some summer music from the town band including Disney classics, 633 Squadron and many more. The highlight of the afternoon was the Sherborne Youth Band, who performed to a very high standard under the baton of MD Jim Bennett. We are already planning and looking forward to our next appearance in the park on Sunday 7th July. We hope you can join us once again, and we’ll try to bring sunshine! We are all very excited about our three Pageant Gardens events this summer. The band will be playing on the following dates, starting at 2.30pm, in the lovely Pageant Gardens, Sherborne. We are obviously hoping for glorious sunshine! But whatever the weather, the band will be on top form, with the Sherborne Youth Band joining us on the June and July occasions. It is a great opportunity for us to show off our great summer programme, and of course you could buy the latest CD! Only £10 you know! 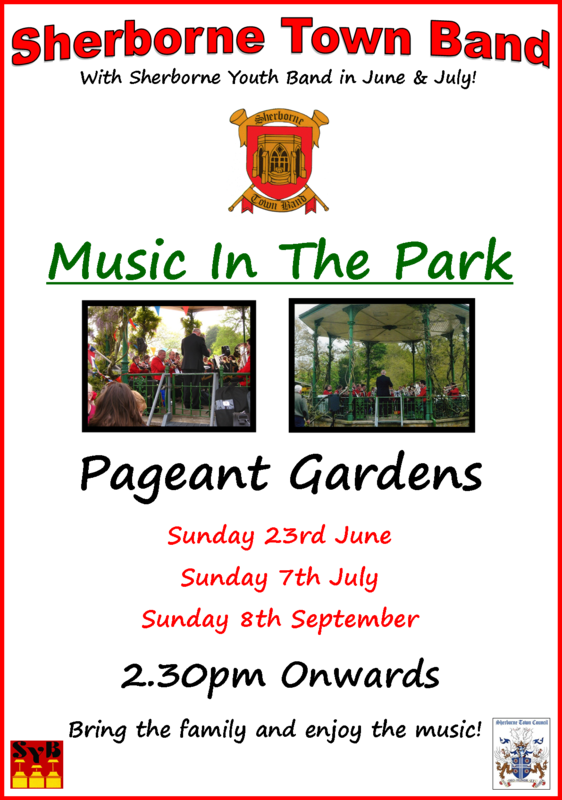 Come along if you can – bring the family, bring a picnic and enjoy the beautiful summer sound of a brass band and the wonderful scenery in the Pageant Gardens. The band would like to thank the Sherborne Town Council for its support and help with the above events. 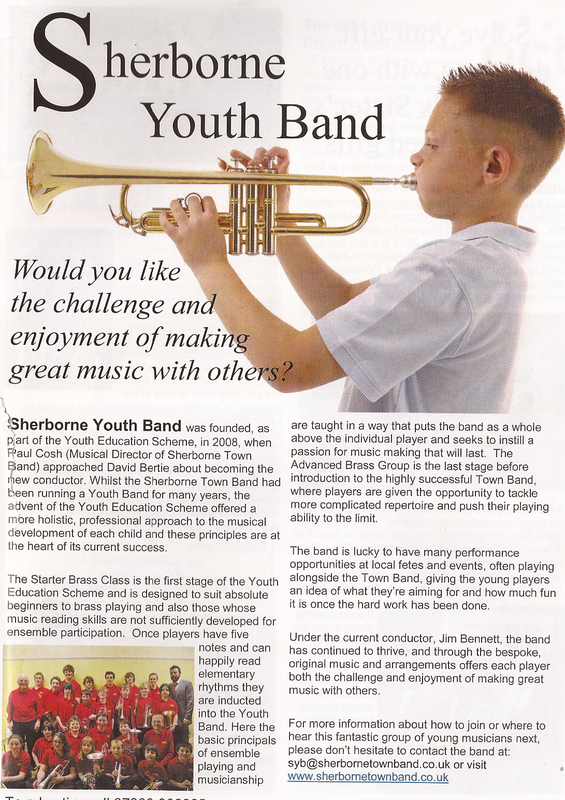 The Sherborne Youth Band has been featured in this month’s edition of the Sherborne Times magazine. The Magazine is a free publication which goes to every household in the town. It is great to see such positive words about the band and to read about the progress and success of the players. The band is going from strength to strength with musical director Jim Bennett and are soon to appear at a summer fete or engagement, near you! The article is shown below. Well we were invited back to the Barton Inn at Barton St. David in Somerset last night for a German themed evening. Last year we were located in the main bar, which is to be honest, cosy and lovely!! But this year we stomped through the night in the skittle alley, which was superb and really worked well! We even had a Spanish member of the band join us, which was especially helpful during the Spanish set! Photos and videos are uploaded to Facebook, YouTube etc. Find the links on the side. A great night and many German themed antics had by all! Thanks to Damien and all the crew at the pub! The band is really pleased with their latest CD Review from Iwan Fox, 4BarsRest.com. The review really tells the story of the CD and its making, and the purposes behind it. We are all very thrilled with the write-up and highly recommend that you go and give it a read! The link is below. You can purchase the CD through our own website… http://www.sherbornetownband.co.uk. Well, now back to the Christmas carolling – keep up-to-date with all events from the main site. Had a very busy morning with Paul Cosh, putting out posters and tickets for our Christmas Sing-along concert, which is on the 15th December at the Digby Hall. Should be a great evening and one filled with a lot of laughs! We have some exciting appearances from members of the band, dressed in Wizard of Oz costumes, and also the amazing Pete Shutler returns to the stage! STB on the Radio… again! Yes – we are indeed on the airwaves again in the next few weeks. Not local radio this time – oh no! The band’s musical director, Paul Cosh will be interviewed on Frank Renton’s Listen to the Band, on BBC Radio 2, Wednesday 7th November at 9.30pm. To find out more information, visit the BBC’s Media Centre pages to find out what will be talked about. Click on the link below. It’s sure to be a good show folks, so listen in and support the band. Of course, I will be posting again, “post production” !! 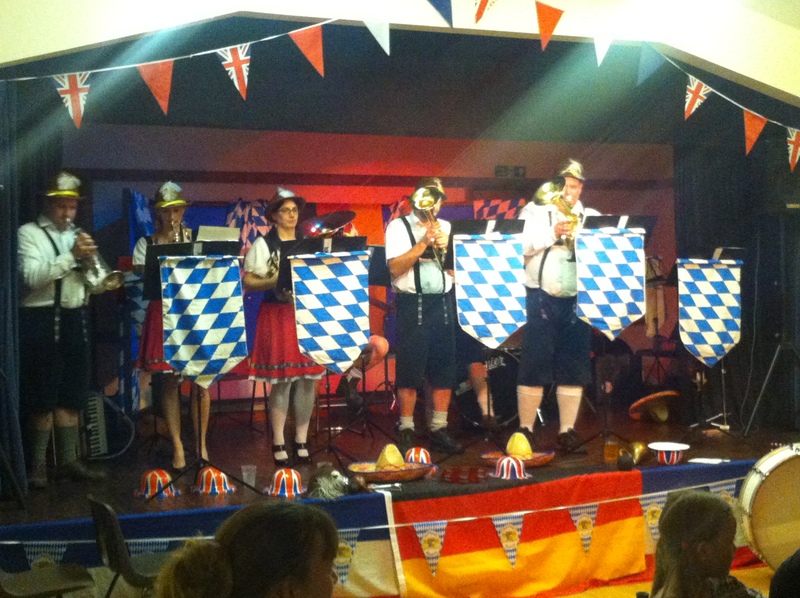 Well, the Stompers were out again last night, Saturday 13th October, in true Oom-pah style at the Long Sutton Village Hall. The organisers had put on a whole host of German themed offerings, including food, drink (beer of course!) and they were certainly dressed to impress! The band had a great night, and with the atmosphere created by the villagers, it was a night to remember. It was a fantastic place to play, and we just hope we’re invited back again! 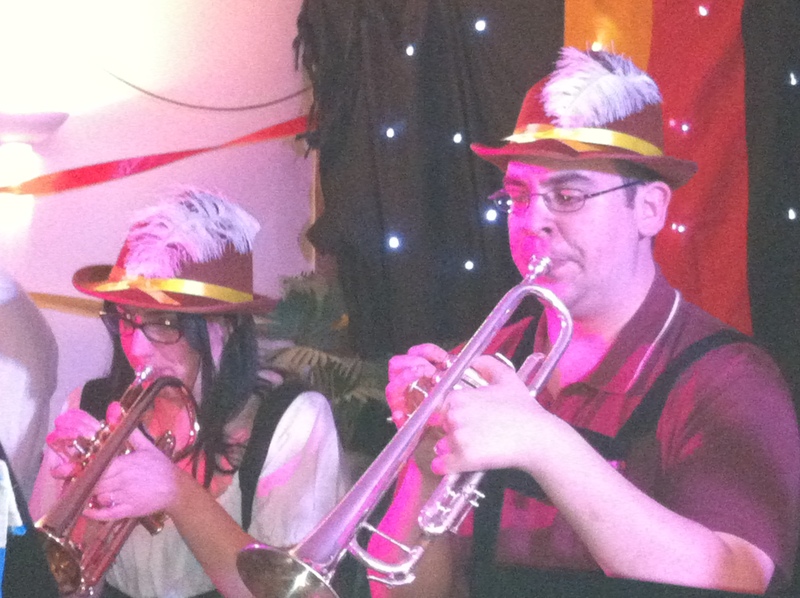 Thanks go to Alan and Sarah who joined the band for the night, and seemed to enjoy themselves as German women for the evening! 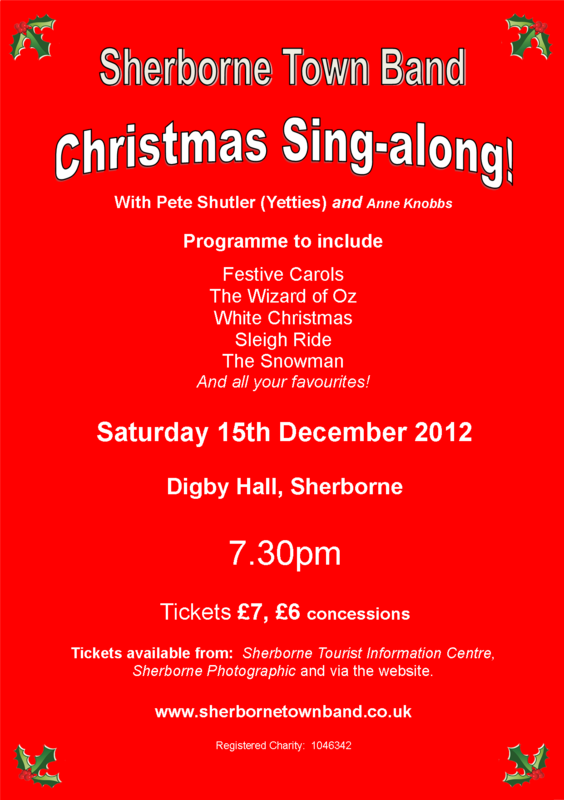 Check out the video below from our YouTube page (http://www.youtube.com/sherbornetownband). I’ll be sure to keep you posted on any other Stomping activities this year, although there are no other dates booked this year.